The same way some families are prone to back problems, certain types of vehicles are known to have common weaknesses, possibly due to design flaws. Let’s look at a few. Although most problems common to Arizona Hondas don’t tend to occur until you are close to 100,000 miles, transmission problems can occur around 70,000 miles. Your transmission may slip, have difficulty shifting, or refuse to shift at all. Transmission repair may require rebuilding or replacing the transmission. Luckily new Hondas include lengthy factory warranties, since if it is not under warranty, transmission repairs can cost up to $4000 at a Honda auto repair shop. Honda owners have reported experiencing loss of function in remote door lock’s along with security alarm malfunctions caused by the power lock malfunction. Your power door locks may also intermittently activate on their own. Each door contains an actuator, which is what moves the lock up and down inside your door when you press the lock or unlock button on your key fob or car door. If one actuator is faulty it can affect the entire system. This can be an expensive fix at a Honda auto repair shop. Another problem high mileage Hondas encounter is having your dashboard display go dark, leaving you unable to read controls and gauges at night. The culprit is usually a faulty circuit board. Many Jeep owners have reported water leaking into the vehicle when it rains. Numerous consumers state that they have experienced this problem from the first day they purchased their new Jeep. The most common place for the water to leak in is at the A-pillar, located at the front edge of both doors. Jeep auto repair shops now offer an improved seal. This flaw has necessitated Jeep issuing a recall on the ignition switch because the switch could short circuit if exposed to moisture or impurities. Many consumers have found this to be a particularly frustrating problem since it manifests in various ways. Sometimes the Jeep won’t turnover at all, sometimes it just clicks when you turn the key. Others state that their Jeep sometimes starts, but then dies after a few seconds. Before the recall some unfortunate Jeep owners spent hundreds of dollars in attempts to have the problem diagnosed and corrected. Jeeps are built to be tough vehicles, but as the miles rack up you may notice your steering wheel shaking at certain speeds, especially higher speeds. This can be due to worn or loose steering and/or suspension parts. The most serious problem reported by consumers is unintended acceleration due to a sticking gas pedal. This problem has caused massive recalls. Your Toyota auto repair shop in Tempe can tell you if your vehicle is included in this recall. One of the most costly problems you can experience with your Toyota is a week transmission. If you notice your transmission slipping, or continuing to wind out rather than shifting when it normally does, you should have it checked promptly in hopes of saving the transmission, since a new one at a Toyota auto repair shop is costly. Early airbag deployment can be a serious problem. Although airbags undoubtedly save lives, they often injure people in the process. Airbags come out at an extremely high rate of speed. Some models are prone to engine failure due to a buildup of oil sludge. Be sure to faithfully follow the guidelines in the owner’s manual pertaining to how often to change the oil and what type of oil to use. The airbag light may come on for no apparent reason. If this happens you need Volkswagen auto repair. A Tempe mechanic can ascertain if your airbag is indeed functioning correctly. Some Volkswagen models also experience engine failure due to a buildup of oil sludge. Be sure to follow the directives in the owner’s manual pertaining to how often to change the oil and what type of oil to use. A wiring harness contains wires that carry energy and electrical signals to components in your car. A short in the wiring harness can cause numerous problems that can be as varied as failure to start, navigation system failure, or problems with power windows, just to name a few. You should always have an electrical problem diagnosed by a mechanic experienced at Volkswagen auto repair. 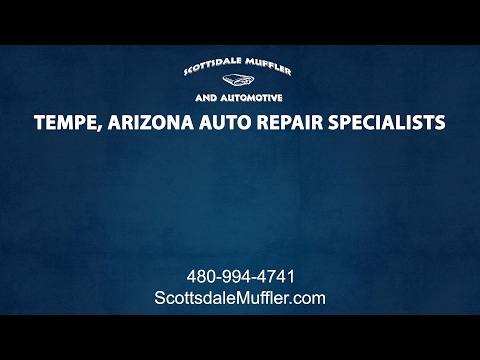 At Scottsdale Muffler & Automotive we offer a full line of repair and maintenance services for both foreign and domestic vehicles. No job is to big or too small for our highly trained mechanics who are familiar with every make and model, including antique and muscle cars! We provide high quality work at a competitive price, probably a fraction of what a dealership would charge. For these reasons and more, nearly all of our customers become regulars.